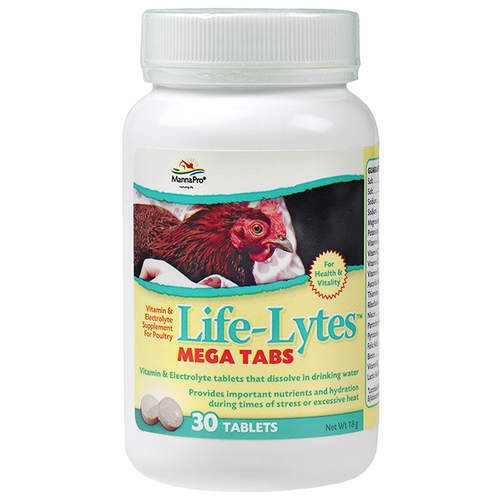 Life-Lytes Mega Tabs by Manna Pro are the perfect way to supplement a flock during times of extreme heat or stress. 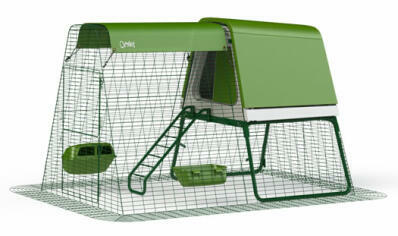 Many poultry experience lessened immunity in such situations as heat waves, re-homing, competitive shows, travel or illness. Each bottle contains 30 large tablets which treat one gallon of drinking water each. Easy to use, economical and perfect for ensuring optimal health and vitality in your flock, the vitamins and electrolytes in Life-Lytes Mega Tabs provide important nutrients and hydration to chickens during times of challenge and stress. To use simply dissolve one tablet per gallon of water. Contains salt, sodium, magnesium, potassium, vitamins A, B12, D3, E and K, ascorbic acid, thiamine, riboflavin, niacin, pantothenic acid, pyridoxine, folic acid, biotin and lactic acid bacteria.